Unlike land lines, cell phone numbers in the US and Canada aren't listed in the phone book. Regardless, you can add your number to the national do-not-call registry: in the US, it's the DoNotCall.gov website; in Canada, it's this website. This alone should keep unwanted phone calls at a minimum. 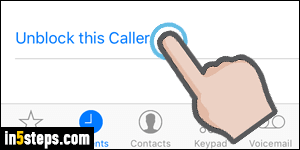 However, Apple includes in iOS a feature that lets you block phone numbers on your iPhone! Start by opening the phone app, and select your Recent Calls at the bottom. Once they load, tap on the "i" information icon next to the phone number. Note: this feature was introduced in iOS 7 (and remains available in iOS 9). 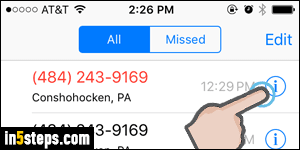 When the call details screen opens, double-check first that this is the right number (before blocking it!) Scroll down and tap on the Block this Caller button. Now tap on the red Block Contact confirmation. Notice that blocking a phone number also blocks that person's SMS text messages and FaceTime! From this point on, any calls placed to your phone from that number will not even appear, even in the recent calls list. The person at the other end will not be told that you've blocked them, but they'll be able to leave a message. To view voicemails from blocked phone numbers, tap on Voicemail in the Phone app, scroll to the very bottom, and tap on the "Blocked Messages" folder. 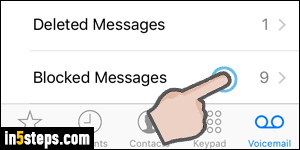 If you decide to unblock that phone number later on, go back to your Recent Calls and tap on the "i" information icon. 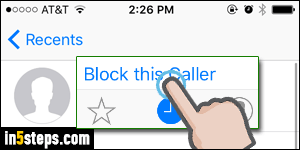 Then, scroll down to the very bottom of the details screen and tap on "Unblock this caller" - and you are done!